San Francisco, CA – iWatermark, is the No. 1 and only watermarking tool available for all 4 platforms, iPhone/iPad, Mac, Windows and of course Android. iWatermark+ is the most popular & powerful professional watermarking tool for Android. Easily, secure and protect your photos with Text, Graphic, Vector, Text On Arc, QR Code, Signature, Metadata and Steganographic watermarks. Once added to a photo these visible and/or invisible watermarks show the photo or video was created and is owned by you. The watermark types in iWatermark are not found in any other software. Some watermarks are visible and others invisible. Both serve different purposes. A visible watermark is where you superimpose your logo or signature onto your image. Invisible watermarks are not so obvious and are buried in the file or image color data. iWatermark is a specialized tool to watermark photographs and video. Less expensive, more efficient, faster and simpler to use then PhotoShop. iWatermark is designed exclusively for watermarking by a photographer for photographers. 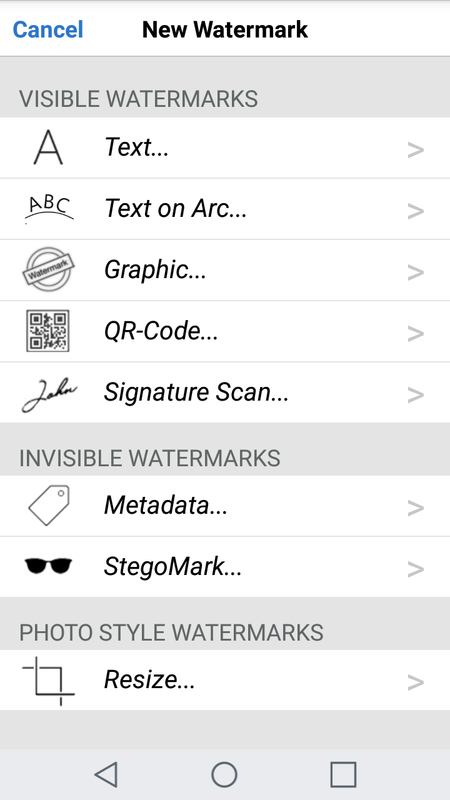 * The ability to create, archive and apply 7 types of watermarks, far more than any other watermarking app. The 7 total watermarks = 5 visible + 2 invisible listed below. * Only iWatermark+ has a steganographic watermark that embeds/encrypts info invisibly in the photo. Adding a watermark subtly displays, no matter where your photo or video goes, that it is owned by you. Always, watermark with name, email or url so your creations have some visible legal connection to you. Promote and protect your company, name and website by watermarking all photos/videos you release. Digitally sign your work/photos/graphic/artwork with iWatermark, reclaim your intellectual property and maintain the recognition you deserve. Easily, secure and protect your photos with visible & invisible watermarks which display they were created and are owned by you. – Multiple watermarks can now be applied to any video like you already could do to photos. – Import single or multiple photos from Dropbox. Use hardware/OS back key to go back in folder hierarchy. – Greater stability in low memory situations. 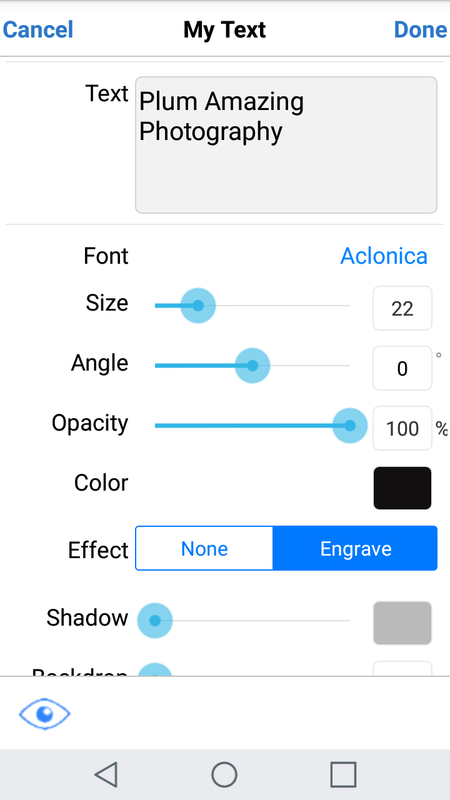 This app is perfect for use with Canon Inc., Nikon Inc., Olympus Inc., Sony Inc., Samsung, SLR, regular cameras and all Android smartphones and tablets. 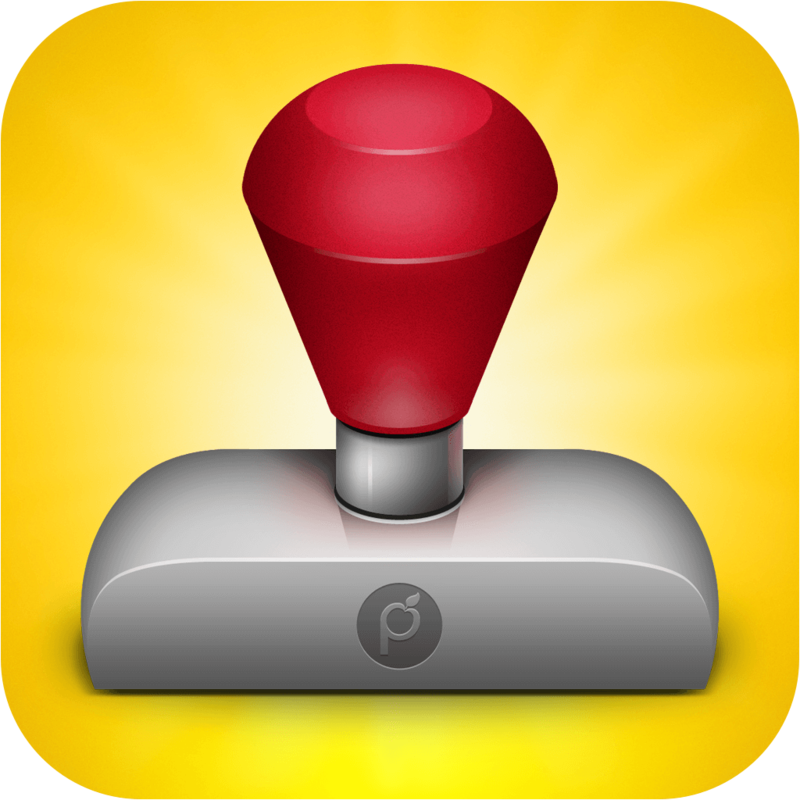 Plum Amazing, Llc is a privately held company dedicated to creating Mac, Windows, iOS apps and of course Android. Plum Amazing is a worldwide provider of mobile and desktop applications since 1995. Plum Amazing creates and sells software via it’s own, Google and Apple’s website but also does development work (programming) for other companies and clients especially in the area of photography. We have a passion for creating great products like CopyPaste, iWatermark, yKey, iClock, TinyAlarm, TinyCal, PixelStick and others. Copyright (C) 2017 Plum Amazing. All Rights Reserved.